Contemporary mainstream psychiatry is tightly and doggedly clinging to a behaviorist perspective of mind that considers all psychological functions as epiphenomenal to the matter-energy interactions. To the behaviorists, mind is essentially the brain in action such that ‘non-material’ phenomena are causally insignificant. This approach has won much scientific admiration over several decades and has become a self-made rule in psychiatry dealing with ‘abnormal’ behavior. That this approach is devoid of any sound scientific underpinnings is the essence of Humanizing Madness (Future Psychiatry Press (Michigan, 2007), a new challenging book by Australian psychiatrist Niall McLaren. Dr. McLaren reminds the scientific community of the need for a sound scientific theory of mind that not only accounts for psychological phenomena more logically but is able to buttress more effective treatment techniques for various psychological disorders. 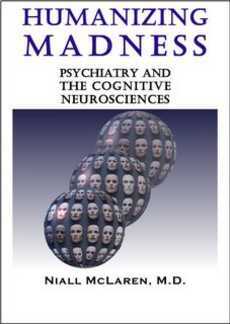 It goes without saying that the author is critical of the arbitrariness of the classification of mental disorders as specified in the DSM and the involvement of the Placebo Effect in relieving neurotic symptoms-something that alone is sufficient to calling for the causal involvement of a non-material mental element in shaping behavior. As Humanizing Madness illustrates with a set of carefully thought out arguments, that certain concepts, though well-established and central to our understanding of human behavior, are loosely defined in scientific terms, relying on an infinite regress that is so offensive even to the reductionist sensibility. Normalcy, abnormality, consciousness, and disorder are just a few of them; the term mind itself is very much open to scientific and logical scrutiny. We simply have no way of defining these in terms of our matter-energy systems except in case we choose to go easy on the infinite regress. Where do we start with clearing the blurred scene of mind and its actual role in causing various behavioral patterns, especially those which involve psychiatric practice? Dr. McLaren would propose his biocognitive theory of mind, a new approach that is essentially a modification of Interactive Dualism, regarding the processes of mental machinery as causally effective and not lying quite outside of the conventional realm of matter-energy interaction. This will not only serve to complete the scientific conception of mind (and related concepts) but also provide the basis for a more effective and rational approach to treating mental disorders. Dr. McLaren’s skills of creating illustrative analogies contribute to the book’s readability. He applies logical analysis to scientific, particularly psychiatric, approaches and still does not give his readers to boredom. Of course Humanizing Madness is not for every reader to enjoy; an interest in science and philosophy, especially in psychology, is required for enjoying this autopsy of psychiatry. There is a brief history of psychiatry in this book and a general feeling of the spirit of objective criticism (though maintaining the personal voice in full), making it a must-read for professional psychiatrists and any graduate of science/philosophy.